Heard that one before? So have we. It's a noble cause, but the practicalities of forcing housebuilders to build are complex. We’re used to politicians repeating themselves, but Ed Miliband isn’t even pretending any more: the Labour leader will today attack housebuilders for ‘landbanking’ – driving up house prices by sitting on vast tracts of land without building on it. In a speech to coincide with the launch of a housing policy review conducted for Labour by ex-BBC Trust chairman Sir Michael Lyons, Miliband will accuse the likes of Barratt and Berkeley Group of ‘hoarding’ land. ‘We will tell land hoarders with sites that have planning permission that they must use it or lose it,’ he’ll say. Sounds a bit like his party conference speech in September, during which he spoke of his ‘very clear message: either use the land or losethe land’. We knew we had heard it somewhere. So rounding on housebuilders is becoming a hobby for Miliband: in September, he said they had enough land stored up to build 200,000 new homes. ‘We will say to private developers you can’t just sit on land and refuse to build,’ he said. To be fair, having sunk to rock bottom during the recession when Redrow, for example, cut its head office workforce from 150 to 40, over the past few months the industry has staged a miraculous recovery. Housebuilders have been the beneficiaries of a succession of the government’s most successful policies, among which have been FirstBuy, NewBuy and most recently Help to Buy. In its first six months, the latter has proved a nice little earner, guaranteeing 5,375 mortgages and sending share prices rocketing (although they did take a bit of a knock last month when the Bank of England scaled back its Funding for Lending scheme). 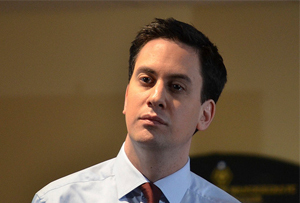 Miliband reckons the industry’s profits are ‘going through the roof’. ‘They have soared 557% since this government took office – even though homes have been built at their slowest rate for more than a century,’ he will say. So what does he propose to do about it? In September, Miliband said Labour would build 200,000 new homes a year by 2020 (to put that into context, 67,422 new homes were built in the first half of this year, according to the National House Building Council). The other point Miliband fails to address is the small matter of developers selling homes off-plan to foreign buyers. For housebuilders, it’s a tough one: it’s easier to convince lenders (who are still notoriously skittish about actually giving out money) that their plans are viable if they have deposits from buyers. Sadly, though, us Brits aren’t particularly comfortable with buying off-plan. Something’s got to give.